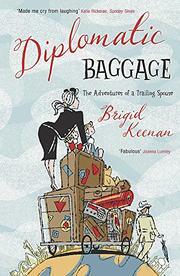 A devilishly witty travelogue from a globetrotting expatriate’s wife. Keenan is quick to point out that as the wife of a peripatetic diplomat, she has indeed seen her share of foreign countries, each with its own distinctive customs and flavors—but it’s not as glamorous as one might imagine. Keenan is at the mercy of mood swings that leave her feeling privileged one minute and “just an appendage” the next, and her life abroad is both eye-opening and humorous. Here, the columnist and former fashion editor for the Sunday London Times compiles memories from 30 years spent living in places like Brussels, Trinidad, Barbados, India, Gambia and Syria as a “trailing spouse.” Alone most days with just the stewards, cooks and housekeepers for company, the author admits to sometimes being reduced to tears, yearning for the company of daughters Hester and Claudia, overcome by language barriers. Luckily, their steward, Ceesay, an Eddie Murphy look-alike, provides unintentional comic relief with his delightfully blunt mannerisms. Keenan and her Buddhist husband are polar opposites, yet they complement each other nicely throughout their travels—a long and often romantic saga that makes up the bulk of the book. From hut-camping in Kathmandu with venomous snakes and repulsive giant jumping spiders (“the size of a small saucer”) to typhoons in Nepal and crocodiles in Ethiopia, Keenan knows well the comic power of a culture-shocked stranger in a strange land. Her anecdotes and bumbling foibles can be laugh-out-loud funny, but they also afford readers moments of personal reflection. The memoir has a tendency to ramble on, but more embarrassing awkwardness always surfaces, and the laughs resume. Adventuresome and enlightening brain candy for the jet set.